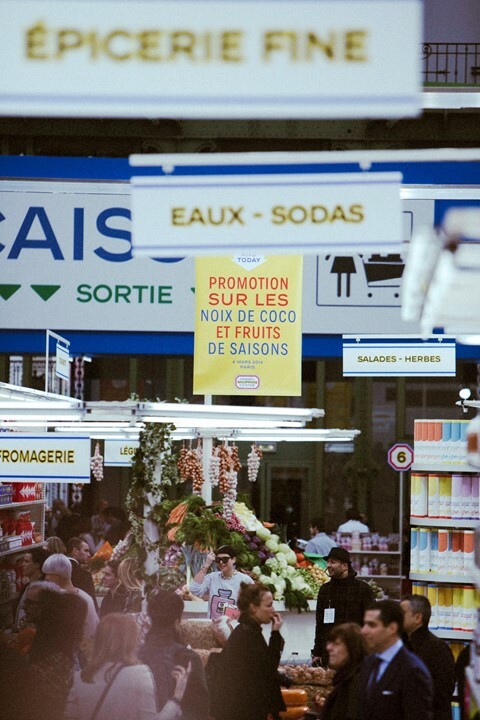 This morning, Karl Lagerfeld took us to an all-branded Chanel supermarché. Rubber gloves, bleach, eggs, ketchup, dusters, gin and soda – you name it, all your daily essentials were there, complete with interlocking Cs. Models walked the aisles dressed in Stepford-wife tweed, swigging from Chanel cognac and popping products in their Chanel chain baskets. So far, so surreal. Then the show finished and the seductive voice of a French man rang through the intercom: “Dear valued Chanel customers, the shopping centre is now closing…” And consumer chaos erupted in aisles one, two, three, four and five! Like ravenous animals, members of the front row clambered over displays, shoveling souvenirs into their handbags and chomping on raw carrots. Editors were spotted stashing onions in their quilted clutches. An astute social commentator – often to hilarious effect – Lagerfeld had unwittingly orchestrated a parody of the somewhat grotesque nature of consumer culture and our insatiable want for freebies wherever possible. Signs read "50% up" rather than "50% off" – have you ever bought something expensive because of the status that extortionate mark-up gave you? Held aloft above the riot of once-demure Chanel-ladies were the ever-present smartphones, recording the moments in selfies and Instagram videos. As with the SS14 Chanel art gallery, Lagerfeld succeeded in plastering his brand across the web as we consumed ourselves with sharing the moment. As we press refresh on eBay, waiting for the inevitable Chanel supermarché stolen-goods bidding war, we count down the hour that realised a thousand viral moments. Rihanna arrives wearing a lilac Chanel Haute Couture SS14 ensemble, complete with sneakers. Cara walks down the runway, bottle of Chanel’s finest cognac in hand. Charlotte Free is spotted walking through the shop, casually carrying a metallic gold and black Chanel chainsaw. Had someone popped to B&Q first? Forget walking. 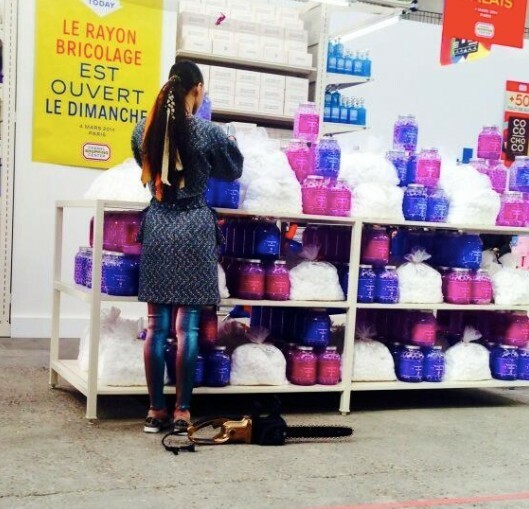 Soo Joo Park vacuums her way around the supermarché. Like mothers in the morning at Waitrose, Kirsten Owen and Stella Tennant have a chat while shopping. Karl Lagerfeld drags Cara and her kaleidoscopic trainers through the supermarket for his finale bow. An intake of breath – who will make the first move? Instead of rushing for the backstage, the audience swarm towards the aisles. Women dressed head-to-toe in Chanel push towards the shelves as if it's the like Boxing Day sale at Selfridges. A woman in a navy coat contemplates a bunch of garlic while chomping on a raw carrot. Navy coat woman’s companion enjoys a red apple. Man in suit climbs display to swipe a Chanel sweeping brush. A tug-o-war ensues with a Chanel "Mademoiselle Privé" doormat. Stocks are getting low in the supermarché, so people have resorted to stealing wellington boots. Practical. Someone hands Anna Dello Russo a stolen pair of Chanel headphones. She has her own, sweetie. All shoplifters are prosecuted upon exiting the Chanel shopping centre, when security guards promptly retrieve all stolen goods from the thieves. 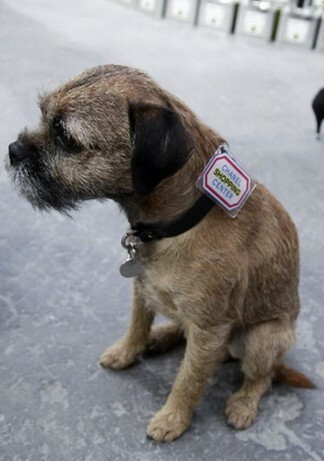 Chanel guard mutt is seen sniffing around an exiting showgoer's Haute Couture SS14 tweed sneakers.